This row of vehicles look like "Toad" brake vans, but the cabin sides and ends are only half-height. They may be tunnel inspection vehicles, or perhaps a passenger "rescue" train for the Severn Tunnel. Likely bomb damage from same 1942 raid as on Beatrice St. Site later used as builder's yard & known as "Bradley's Corner"
Possible bomb damage - gap in terrace? "Flying Banana" diesel rail car. Looks like 1942 bomb damage here - end terraces don't have upward slanting back bedroom roofs. End terrace at junction of Ferndale & Whitehouse Rd (where bomb also hit) hit has same missing end terrace (aka "Bradley's Corner"). PANNIER TANK WITH SHUNTERS TRUCK ATTACHED. RAKE OF CATTLE WAGONS NEXT TO UNLOADING PENS. Looks like one of the single ended ones, built to run with another unit and a coach between them to make a three coach set. Five or more horsebox vans here - refurbished or being made redundant? Thirteen 'Toad' brake vans here - possibly redundant, possibly refurbished? 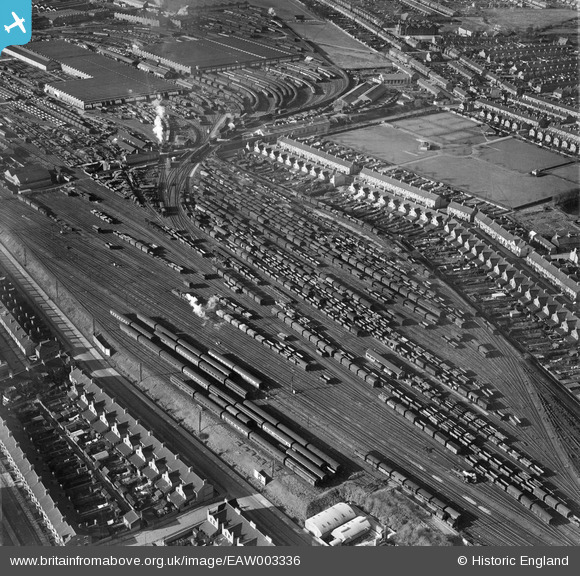 Britain from Above has a stand at the Warley National Model Railway Exhibition at the NEC on 23/24th November 2013. Well done Britain from Above. There are so many wonderful photos in this magnificent collection, words fail me. This photo is so useful as a resource for railway modellers.